Vagmi practices Civil Litigation with an emphasis on subrogated claims involving construction-related litigation and contractor’s negligence, environmental disputes, product liability, and property damage. 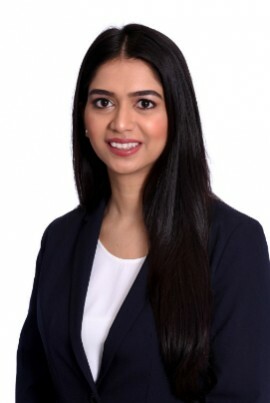 Prior to joining Mason Caplan Roti LLP, Vagmi articled and practiced at a prominent insurance defence firm in Toronto, assisting counsel in defence of personal injury, occupier’s liability, and contractor negligence. She has appeared in front of the Superior Court of Justice, the Ontario Court of Justice, the Small Claims Court, the Social Benefits Tribunal, and the Landlord Tenant Board. Vagmi obtained her law degree from the University of Windsor. While at Windsor, she worked as a litigator at the community legal clinic in Windsor representing underprivileged clients in civil, criminal, and residential tenancy matters. Vagmi completed a semester at the University of Mannheim in Germany through an exchange program. Prior to attending law school, Vagmi completed her undergraduate degree in Life Sciences and worked as a research assistant in Molecular Biology and Pathology. During articling, Vagmi was Co-Chair of the Articling Chapter of the Women’s Law Association of Ontario. She now sits on the Mentoring and Social Committee.